Cranberries have long been a staple of the American Thanksgiving. Now, you can adore this Thanksgiving treat on an Italian charm. Shown here is an abundant amount of cranberries, overflowing out of a clear container. 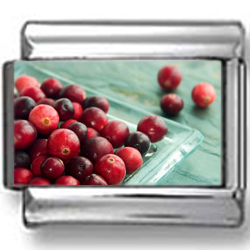 Set against a blue background on a stainless steel base, this photo of plump cranberries really pops!